The reality is we live in a busy culture where it is hard to simply sit still at the feet of Jesus. Courtney Joseph. The last (?) 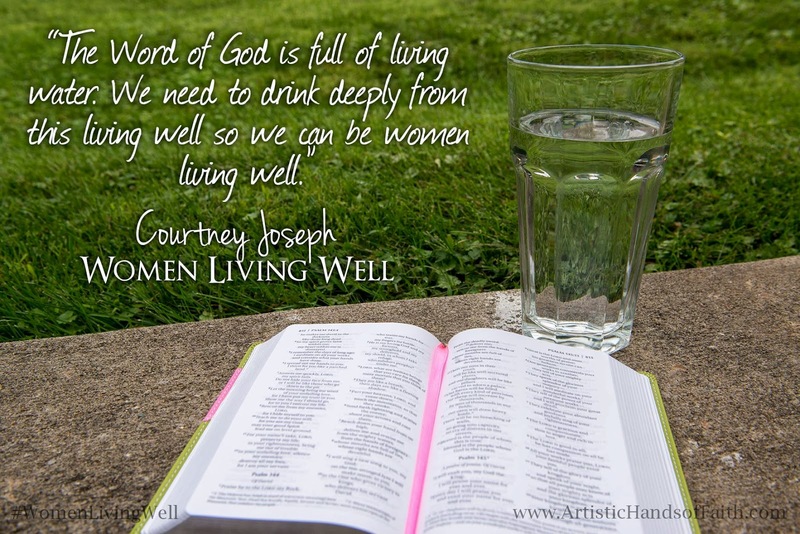 post based on the book "Women Living Well," the book I has the pleasure to get a sneak peak of as part of her launch. The book is on sale now at most book stores or online. This area has been an interesting one for me. For the last few months, I have faltered here. Life has been so crazy, so upside down that I have neglected my walk. As we settle into our new house, I'm hoping to fall into a new routine. Will I be able to continue to rise early and spend a few minutes in prayer? 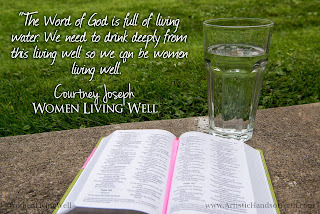 In reading His word? This morning when I woke, I grabbed my iPhone. And when to my Bible app. I love this app -- I can read the Bible in almost any translation I want. I can compare the translations, sometimes the use of a different word helps. Do you not know? Have you not heard? The Lord is the everlasting God, the Creator of the ends of hte earth. He will not grow tired or weary, and his understanding no one can fathom. He gives strength to the weary and increases the power of the weak. Weary. Oh yes. There is so much to do and just not enough time. Our new home is a mess. Boxes are still everywhere. There are still many to go through and most likely throw or give things away. We do not NEED most of it. 10 boxes of toys. Several boxes and suitcases of clothes. Enough plastic containers to fill a shelf in the pantry. And then, of course, the boxes full of memories that we can't bear to part with, but hold little to no meaning to anyone else -- Rocky & I call these the boxes that are for Maggie & Jessie to throw away after we're gone. After I dressed this morning and sat down in our new living room, and wished for a cup of coffee [coffee pot did not survive the trip], I started to pray, but soon became overwhelmed with it all. I wanted to just sit. And not think. And not look at what still needed to be done. And I only had a few minutes before I heard Jessie from the bedroom. And then before I know it, the morning rush begins. I know I need to be deliberate about this. If I'm not, I will get even more out of practice. Just as I need to schedule time to go to the gym [and how amazing is it that I actually look forward to going now], I need to schedule time with God. I guess the good news in all this is that God doesn't move. He is still there, waiting for me to return. Waiting on me.